Karaka is a modern folding version of the traditional Southeast Asian Karambit. Its hawksbill blade is VG-10 stainless steel and features a non-reflective titanium carbonite TiCN) coating. 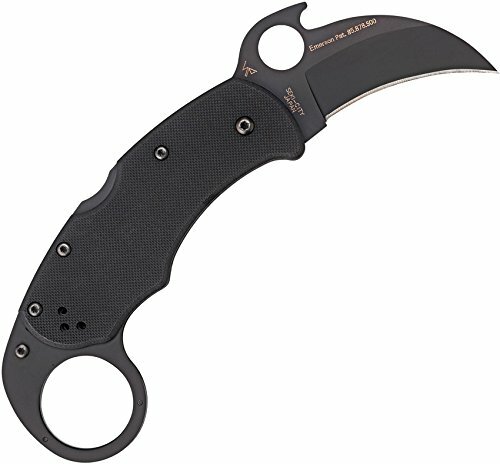 Includes both a Trademark Round Hole and an Emerson Opening Feature for swift, blade function, and is paired with a high strength back lock mechanism. The Karahawk's handle is constructed with textured G-10 scales and full skeletonized stainless steel liners that are also TiCN coated. The signature ring is reinforced with a G-10 insert and allows traditional Karambit manipulation techniques. A reversible hourglass clip provides ambidextrous tip-up carry and like all the knife's other hardware, features a matching low-profile black coating. Overall length 6.5" - blade length 2.35" - closed length 4.50"